Powers/Abilities: Emma was an extremely good cleaner, and was able to keep a large house the size of Braddock Manor dusted and hoovered single handedly. Limitations: Emma needed to wear glasses to see, and had a large number of her teeth replaced by dentures, which might have given her difficulties with eating harder types of food. 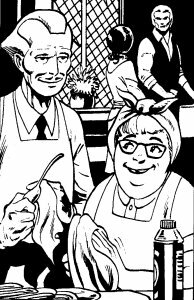 History: (The Daredevils#2/1 (fb) - BTS) - Emma Collins worked as the char lady for the Braddock family for most of her adult life, cleaning the Manor and seeing to the household. (Captain Britain I#13/1 (fb) - BTS) - Working on a number of delicate projects, Sir James Braddock forbade Emma Collins from entering his laboratory. (Captain Britain I#13/1) - Some time after Sir James' death Emma decided to clean the laboratory. Upon entering she expressed shock and compared the room to a set from a James Bond movie, as it was full of "fancy machinery". Undeterred, she set about mopping the floor, although she did decide to be careful not to damage any of the expensive equipment. She noticed that some of the systems still seemed to be switched on. Rather than risk electrocution Emma located what she thought was the master switch, and unplugged the system, figuring no one would ever know (and unknown to her, miles away this deprived a super-villain of his power source in the middle of a crucial battle - see comments). A few minutes later, once she had finished mopping the laboratory floor, Emma turned the power back on, and left the room. (Captain Britain I#15/1) - Emma realized she had left her dust pan in the laboratory and returned to retrieve it. When she opened the lab door she was shocked to witness the gigantic form of Mastermind standing over Captain Britain, about to kill the hero. The holographic villain blasted Emma with his laser, and she collapsed, but the distraction had provided the hero the breather he needed. After defeating Mastermind, Captain Britain checked on the prone char lady, and was heartened to find a pulse. However he realized she was badly hurt, and called for an ambulance to come urgently to the Manor. Then he carried her unconscious form outside, where he was soon met by both an ambulance and the police. Emma was taken away to hospital. (The Daredevils#2/1 (fb) - BTS) - Mastermind took control of Emma's mind, bringing her back to the Manor. For the next few years he controlled her, using her to keep the place tidy, letting her believe that everything was completely normal. (The Daredevils#2/1) - Brian Braddock finally returned to the Manor site, and discovered the place still standing years after he believed it had been destroyed in an airstrike. He entered, and to his increasing confusion was greeted by Emma, who was overjoyed to see him "back from university". She rushed off, saying she wanted to be the one to tell his parents he was back, and insisting they would be so happy to see him, ignoring his protest that they were long since dead. He later discovered the truth behind her presence and disabled the computer, freeing her from much of it's influence. (The Daredevils#4/1) - Emma slept peacefully through the night, completely oblivious to the Special Executive's invasion of the Manor, even when Zeitgeist walked through the wall of her room to check on her. (Mighty World of Marvel#16/1 (fb) - BTS) - When Captain Britain and his allies fled from the Manor at the start of the Jaspers' crisis, they were forced to leave Emma behind in the computer's care, as several years under it's control had left her dependent on it for several basic functions. (Mighty World of Marvel#16/1 (fb)) - When Brian returned to the Manor after the crisis ended, he spent six weeks working to release Emma from the computer's control. He sought to restore her ability to act without instruction and her individuality without causing her trauma from the separation, his task made more difficult by the discovery that the computer had somehow grown "fond" of her. Eventually he succeeded in freeing Emma, leaving her with no memory of her enslavement, thought she did retain a lingering sense of loss. (Mighty World of Marvel#16/1 - BTS) - Brian brought the were-creature Meggan to live in Braddock Manor, and introduced her to Emma. 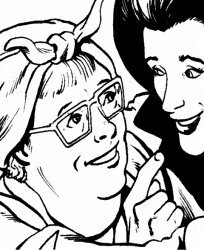 The char lady did her best to accept the new arrival, although she admitted to Brian that she found Meggan's strange looks worrying. (Mighty World of Marvel#16/1) - Emma happily joined Brian in welcoming Betsy Braddock and her friend Alison Double back to the Manor. Betsy was surprised but gladdened to see Emma was apparently back to normal after her time controlled by Mastermind. She joined the group as they watched Brian's appearance on a local TV news show, depicting the reconstruction of the Manor. (Captain Britain II#2/1) - While Brian and Betsy discussed the morning newspapers over breakfast, Emma puttered around in the kitchen behind them. (Captain Britain II#5/1) - A few days later, late in the evening, Emma and the rest of the household heard a number of loud crashes which heralded the battle between Captain Britain and his counterpart Kaptain Briton. Rushing from her room to see what had happened, she met Alison on the stairs and began to head down to the ground floor to see what was happening. They were intercepted en route by Fascination, one of Gatecrasher's Technet, who took them to join the rest of the assembly. Emma looked on the variety of non-humans present, and tried to tell herself she must be asleep and having a horrible dream. As the battle between the dimensional doppelgangers continued, Emma and the others listened as Gatecrasher explained that her outfit were there to apprehend the fugitive Briton. The battle ended, and the Technet departed with their captive. Viewing the devastation, Emma mentioned she hadn't seen so much damage since the blitz. Alison consoled her and said they could begin clearing up in the morning. (Captain Britain II#7/1) - After the attacks on the Manor, the Mastermind computer reactivated it's interactive hologram and offered it's services to the Braddock twins. Betsy commented that this hologramatic form would terrify Emma, so Mastermind amended his visage, taking on the appearance of a middle-aged butler, whom Betsy dubbed Jeeves. Although Brian remained wary of this development, Emma warmed to Jeeves immediately, clearly finding him attractive. (Captain Britain II#8/1 - BTS) - Emma was asleep when RCX arrived at the Manor, bringing a group of Warpies with them. When some of the Warpies began to tear up the front lawn, Brian ordered Jeeves to wake Emma and take her to the safety of the basement. (Captain Britain II#9/1) - Standing on the basement steps Emma asked if the noise of the battle outside was the Nazi bombers again. Jeeves explained to the RCX agents with them that he was subliminally controlling her to help her cope with the strangeness, and that she believed they were back in the Blitz. As the battle became increasingly loud, Emma was the least disturbed by it, taking it in her stride. After the combat ended, Emma and the others emerged to check on the aftermath. RCX unloaded their Warpie charges into the Manor, and Emma decided the mutated children were evacuees. (Captain Britain II#14/1 (fb) - BTS) - Mastermind noticed that Emma spent most of her time sleeping. Concerned, he examined her and learned that the years under mind control had caused long term damage to her nervous system. He tried to find a cure, but came up blank. (Captain Britain II#14/1) - On Christmas morning Jeeves told Emma he had the dinner preparations in hand, and that she could go and watch the children opening their presents. Once she had left the room Jeeves had a discussion with RCX agent Michael, where the hologram revealed that Emma had less than a year to live. Michael chastised Jeeves for talking like a love-sick mortal; Jeeves did not reply and his countenance was inscrutable. Shortly afterwards the hologram unveiled a synthetic version of Jeeves, revealing that this creation would accompany Emma on a final cruise. A few days later they departed on their holiday. (Excalibur I#47 (fb) - BTS) - A short while afterwards Emma passed away. (Excalibur I#27 (fb) - BTS) - Jamie Braddock discovered when he returned home that Emma had died. Unhappy with this, he used his reality-warping powers to bring her back, just the way he remembered her. She took up household duties in the Braddock's London townhouse. (Excalibur I#19) - When Shadowcat returned from an extra-dimensional trip and ended up in the Braddock townhouse, Emma provided her with food and clothing, and unsuccessfully tried to dissuade her from entering Jamie's room. (Excalibur I#27) - Emma brought Jamie a cup of tea and some biscuits. Nigel Frobisher arrived to inform Jamie of Excalibur's return from a cross-dimensional sojourn; Emma offered him a cup of tea too, but Nigel angrily smacked the cup out her hands, spattering her with hot tea. Jamie grunted angrily, and instantly realizing his mistake, Nigel hurriedly apologised, first to Jamie and then to Emma. Emma accepted the apology, but Jamie didn't, and turned Nigel into the female form of the crimelord Vixen. Still conditioned not to notice anything unusual about events around her, Emma continued unperturbed with her cleaing duties. Comments: Created by Gary Friedrich (writer), Herb Trimpe (penciller) and Fred Kida (inker). 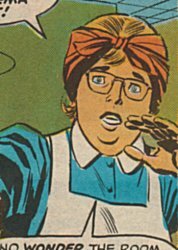 Emma's decision to suddenly clean Sir James' laboratory so long after his death was a case of incredibly fortuitous timing, as when she switched off the power, she temporarily deactivated the Mastermind computer just as it's pawn Dr.Synne was in the middle of a confrontation with Captain Britain. It's not entirely clear how long before Sir James died (Brian was at college at the time when they died, and by the time Emma decided to clean the place, he was a post-grad at university), but it was "so long ago" according to Emma. So what made her decide to clean the room right then? Coincidence?...or the hand of Merlyn, master manipulator? At the end of Captain Britain Weekly#15, Emma was taken away to hospital. Years later Captain Britain found her back in the Manor, even though the rest of the world believed it had been destroyed in an airstrike. Why did she go back to the Manor and fall under Mastermind's influence if she be thought the place had been demolished? Perhaps the answer lies in which hospital she was taken to. Previous issues stated that the only medical facility within fifty miles was the Morder Research Centre, run by Dr. Ramsay, who had been a pawn of Dr.Synne, who was in turn a pawn of Mastermind. So it's entirely credible that Mastermind might have once more extended his influence to get Dr. Ramsay to send Emma back to the Manor, providing him with a pair of hands in case he needed any work done. Mastermind and Brian Braddock both claimed Emma was under the computer's control for seven years between Captain Britain I#15 and The Daredevils#2. However, given Marvel's sliding timescale, this should be treated as a topical reference. During his briefing in advance of the Special Executive's infiltration of Braddock Manor, Wardog refers to Emma as "Mrs. Emma Collins". Assuming he was accurate (and he was about everything else in the briefing), this means Emma is or was married. Since we've had no sign of Mr. Collins, she's either divorced, separated or widowed - I'd lay odds on the last of those options, given the kind of personality and character she is, and a later comment from Betsy Braddock that Emma has no living relatives. 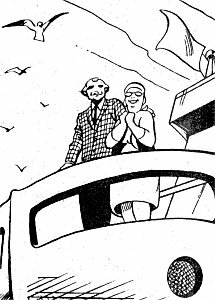 In Captain Britain Monthly#9, when Emma thinks she is back in the time of the Blitz, and calls Jeeves "Arthur". Either she believed the Jeeves hologram was "Arthur Jeeves" (unlikely since she doesn't call him Arthur any other time), or else she thinks he is someone by that name who she knew during the Blitz. Her mind at the time saw the superhero battle as being equivalent to the Blitz; given her attraction to Jeeves, if he is seen to be equivalent to this Arthur, perhaps that was the name of her husband. Actually, due to the sliding timescale, it becomes increasingly unlikely that Emma could have been around during the Blitz (World War II). It's still passable for another few decades anyway...unless it was some OTHER Blitz. Emma appeared in Excalibur I#19 and#27, but this was because Jamie Braddock, unhappy when he found out she had died, used his reality warping powers to create a version of her the way he remembered, and not the real Emma. This Emma looked after Jamie in his London townhouse, unable to notice the strange things happening around her. Emma also appeared in Excalibur: The Possession one-shot, when she welcomed Brian and Excalibur to the Manor. However, as was later established in Excalibur I#47, this was not a genuine occurrence, but a shared illusion generated by Merlyn.